Big banks in the Philippines are earning in record profits. As a matter of fact, third quarter earnings show a huge jump in net income for universal and commercial banks by about 43% from a year ago (according to the Banko Sentral ng Pilipinas). Total net income for the banks breached 114 billion pesos for the third quarter. This shows exactly just how the banking sector benefits from the Philippine’s growing economy. That’s very good news for those in the banking industry. More so for the owners of these big banks. They are making a killing since a growing economy needs a vibrant financial sector. Banking as a business is very promising. But what about us ordinary people who are the customers of these banks. 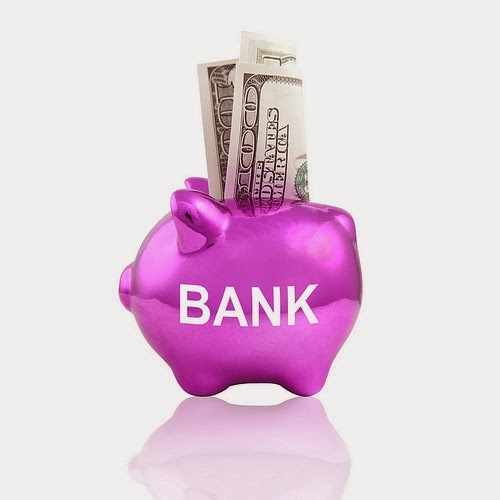 What can we do to take advantage of the inevitable rise of the banks? How can we get a piece of the pie that we know is going to be much much bigger? One thing that we can obviously do is to invest in these banks.The most readily available way to do that is to buy their stocks from the Philippine stock market or any other stock market where their stocks are sold. The tricky part, however, is to know which banks to invest in. Is there a metric that we can easily look at to assess how banks perform from the point of view of an investor? As a matter of fact, there is! It's called Return on Equity or ROE for short. As the name implies, ROE measures the return or gain on every peso of equity in a particular company. ROE is therefore calculated by dividing the net income in a particular period (usually one year) by the total shareholder's equity. As you may know, equity represent company ownership which includes stock owners or investors. So really, ROE is a measure of how efficiently a company is able to make a profit with the given its existing resources. The higher the ROE, the more profits there are for every peso invested in a company. If you think about it, you’d want the company where you invest your money to have the highest ROE because that company will bring in more profit for the money you will invest than another company with less ROE. Of course, there’s the usual disclaimer in all of these. Historical performance is not a guarantee of future outcomes. Nevertheless, becoming aware of how ROE’s of different banks stand right now is still far better than being ignorant about it most especially for potential investors. 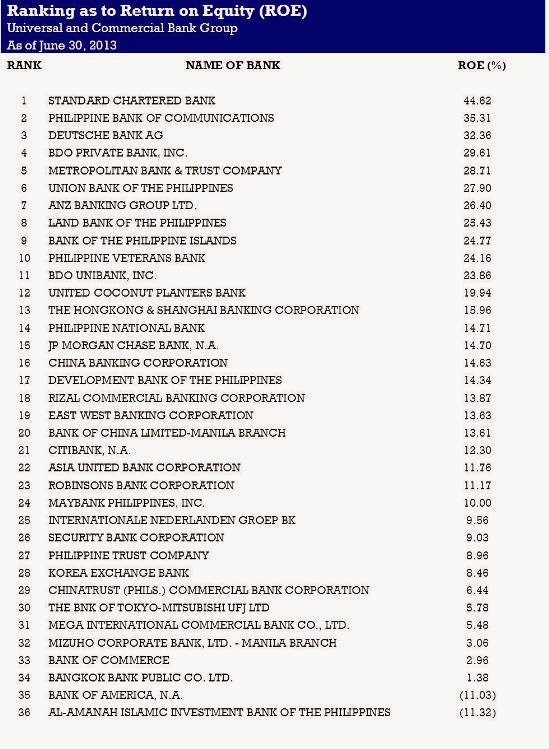 So without further ado, here’s a list of the top banks with the highest return on equity in the Philippines. This list is updated as of June 30, 2013 as compiled by the Banko Sentral ng Pilippinas (BSP) which is the central bank of the Philippines. It’s a list that will, hopefully, make it easier to compare the competitive edge of one bank against another. I would remind the reader, however, that this is not the only point of comparison. 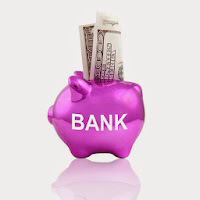 There are many other analytical tools that may be used to understand how well banks perform against another bank. This is just one area that should be looked at. But it’s an important measure of efficiency that’s why the central bank felt the need to keep track of it.